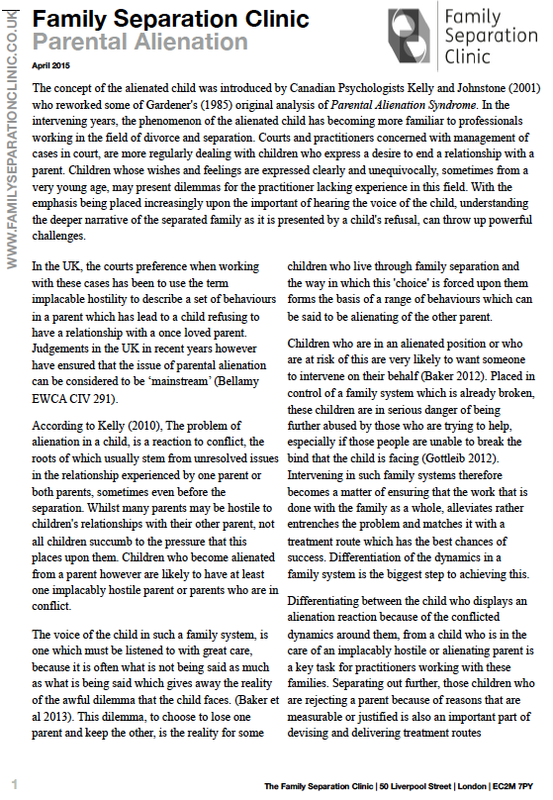 One of the things that we do at the Family Separation Clinic is publish papers and documents which you can use to inform people about Parental Alienation and its impact on you, your children and their wider family. The above is one of the documents that you can download from the site. In our work with families, we educate as we go along, training CAFCASS, the Judiciary, Schools and Nurseries and GP’s about the impact of alienation and how it can be helped. We always encourage all parents and wider family to share in the information spreading as much as possible, so that the ripple effect of sharing information and experience, creates positive change for other people who are affected or who may be affected in the future. Please visit us at the Family Separation Clinic or email us at office@familyseparationclinic.co.uk for a list of documents that you can use to help your case and/or spread the word. In the past we have presented to CAFCASS Cymru and the Judiciary in Wales and at the House of Commons with Professor Bala from Canada. in recent weeks we have presented to the Judiciary in Derby and will shortly be presenting to CAFCASS in Derby, on the work we do and how partnership working can raise awareness. I will shortly be presenting to the Missing Children Europe Conference in Brussells and In November I will be speaking at the Family Law Association of Scotland’s Annual Conference. Awareness raising alongside working with families is an important part of what we do at the Clinic and as we move closer to launching new projects, books and forums, we will increase this work right across the UK. Keep checking back for details and for our resources which are working on now. All of this helps us to raise awareness and strengthen the understanding of professionals as well as parents. Come and join us in raising awareness and sharing information, we are getting ready for a very exciting autumn. All of our downloadable resources are free of charge and can be widely circulated. You are free to share them providing that you always credit the Family Separation Clinic as the source. Next Treating alienation in children: it is therapy but not as most people know it. Thank you for providing this information. This is a wonderful platform to broadcast your actions. There are points to raise which are of interest to the public at large. What your clinic provides is a voice of sanity in at least two nations, England and Wales, which in relationships to parenting is anachronistic. Where laws to protect the innocent and the rights of those protecting those who are innocent, minor children do not exist. As it is not a legal requirement for both parents to have a legal right to be a parent in England and Wales, currently. Why? Accords to presume right, do not act as a hapteron to “hold fast and sustain”, in contemporary terms only legislation can enact this. Currently there is NO legislation to support what is the fundamental best interests of our children. There are two main reasons in this criteria of argument. The first being that minors do not vote. The second is that only one parent has the legal right to parental responsibility (the female mother); the father does not have such a similar, absolute right, but only “aspects of parental responsibility” are their rights; financial, but not the right of being acting responsible, that is being engaged in their child’s life. Therefore these two points allow one parent this “responsibility” (Family Law) or when incapable, the State (Public Law) intervenes. When families find they cannot live together, mediation is still not a legal requirement. 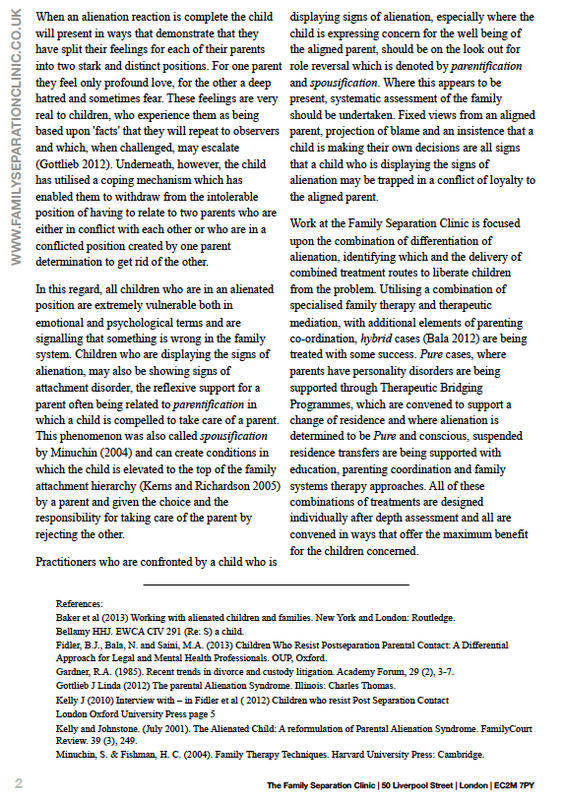 The Courts are still pampering to the “whims” of one parent’s vagaries and false allegations (unless proven both criminally and in the balance of probabilities), knowing that child psychologists are leaning heavily on the balance of reality that dissociation within a family unit is severely damaging to a child’s best interests and therefore directions of abuse which are of criminal intent! Your clinic unequivocally suggests that children DO wish to be brought up with both parents. If this is so then why are 1/3 children living in disharmonious families where one parent is not engaging as a parent in the best interest of their child? Which parent is causing children to be segregated or abused in this manner? If this is the reality why are the Police authorities not arresting and charging those parents who initiate and continue such abusive actions? It is a criminal offence to cause harm to animals (both domestic and wild) but not minor children it seems! It is only recently that psychological abuse was added as a factor of criminality in the domestic violence scenario. What human society do we live in where 3.8 million children in the United Kingdom are living with disruptive and disengaging family lives and certainly not in their best interests? It may be the reason too, but not always, that the 2.7 million children (Office of National Statistics 2015) who are living in relative poverty do so because of the parent causing family dissociation. Children who engage with both parents are supported in ways which alleviate so the called “poverty factor” both socially and financial. Engaging children with all members of families has the cause and effect of encouraging better relations prior to separation, and alleviate those disharmonies which existed at that time. Children will observe that Mum and Dad are getting along better now and the children will be happier too. If this is the reality, where is the legislation to protect our children’s best interest, those living in this state of play? When you step back and look at the big picture only then can we appreciate what the Parental Separation clinic is attempting to support. Now imagine that if every NHS Health Centre or Health Clinic had a small Parental Separation Clinic, (dissociated families are stress related families) and we had civilised legislation in England and Wales (Scotland and Northern Ireland too); that the funding saved in totally unnecessary Court time were transferred to such “clinics”, they would be funded (really self funded). Is it not more preferential than the situation at present? When we have Responsible Parity in Parenting, such could be the outcome. But why do we not? One real answer. Aggressive feminism in Government, pure and simple. Why was Ken Clarke (Secretary of State for Justice) dismissed in 2013 when he agreed with the Family Justice Select Committees for responsible parity of parenting. Suddenly he was out and CAP was in! Make legislation to change this as I mention (as also on other sites) then the 3.8 children would at least have an opportunity at having a better life, in all respects. And did you know that this number of 3.8 million children is more than all those minor children murdered in the Nazi extermination camps! Now isn’t this an interesting but very sad fact!